Is Tanzania,Uganda dumping counterfeits in Kenya? Some of the counterfeit goods seized by Kenyan authorities in an ongoing nationwide crackdown on illegal businesses. According to Kenya’s Anti-Counterfeit Agency (ACA), all Kenyan major border towns are hot spots for counterfeit goods. Kenya has marked her border towns as hotspots for counterfeit goods, signaling such products are being smuggled into the country from neighbouring countries. This comes as the long-stretch porous borders mainly along the Kenya-Tanzania and the Uganda border continues to be blamed for entry of contrabands. According to Kenya’s Anti-Counterfeit Agency (ACA), the Kenyan border towns of Isebania, Migori, Namanga, Kisii and Kajiado (within proximity of Tanzania) are hot spots for counterfeit goods. Malaba, Busia, West Pokot, Kapenguria, Kitale and Kitui towns which are easily accessible from the Kenyan-Ugandan border have also been marked as hot spots. Other towns are Mandera, Isiolo, Moyale, Lokichokio, Wajir, Garissa, Lamu, Liboi and Nyeri which further points to Ethiopia and Somalia as possible sources of counterfeits. On the other hand, the Port of Mombasa remains a key entry point for such goods either directly imported to Kenya or imported for the regional markets especially Uganda which imports 80 per cent of her goods through Mombasa, before the goods are diverted or re-exported back into Kenya through illegal routes. “We have a very long stretch of borders between us and our neighbours. A huge section is porous and this is where some of these products are being sneaked across the countries,” ACA Executive Director Elema Halake told journalists at an anti-counterfeit forum in Nairobi on Monday. ACA chairperson Flora Mutahi added that though much has been done to curb the illegal business, counterfeit goods are still finding their way into the country. “It is a problem affecting not only Kenya but the region at large. We must work closely to end this business,” Mutahi, the former Kenya Association of Manufacturers (KAM) chair said. Fast-Moving Consumer Goods (FMCG) are the most counterfeited products. A government study has revealed mobile phones are the most counterfeited at a rate of 51.8 per cent. This is followed by alcohol and beverages (30.8 per cent). DVDs/CDs , bottled drinking water and pharmaceuticals add up to make the top five most counterfeited products. Other products are detergents, food products, electrical gadgets, perfumes and cosmetics, cigarettes and computers (both software and hardware). At least 70 per cent of Kenyans or consumers in Kenya have purchased or handled counterfeit products. Of these, 19 per cent purchased the products knowing very well they are counterfeits. 81 per cent however purchased unknowingly, government statistics indicate. The leading reason for purchasing counterfeit is the price where majority (49.6 per cent) says they are cheap. 17.3 per cent are said to buy counterfeits as a result of unavailability of original products in the market. According to ACA, 18.3 per cent are unaware of the risks, hence go ahead to purchase such products while other reasons account for the remaining 14.9 per cent. “It may look cheap but people need to know cheap is expensive. What we are telling people is stop purchasing counterfeit. You would rather come back when you can afford the original genuine product,” Mutahi said. Counterfeits have been described as a hindrance to the growth of the local manufacturing industry, which could affect the realization of President Uhuru Kenyatta’s Big 4 agenda on manufacturing, as the government targets to increase the sectors GDP contribution to above 15 per cent from the current paltry 7.5 per cent. Kenya Association of Manufacturers estimates that 40 per cent of the local market share is lost to counterfeiters with the government losing more than Sh200 billion (US$1.99 billion) in potential revenue annually. Other estimates from KAM give the loss as a result of counterfeiting at Sh50 billion (US$497.2 million) a year. To address the problem, President Uhuru Kenyatta last year (April) commissioned a multi-agency taskforce which brings together key government institutions among them Kenya Revenue Authority, ACA, Kenya Bureau of Standards (KEBS), the National Police Service and Kenya Railways to unite in eradiating counterfeits and illicit trade. Other entities in the operation include the Pharmacy and Pharmaceutical Board, Kenya Ports Authority (KPA), Public Health services, Immigration services and Weights and Measurements Service Kenya. The President appointed Deputy Head of Public Service Wanyama Musiambu to lead the taskforce. 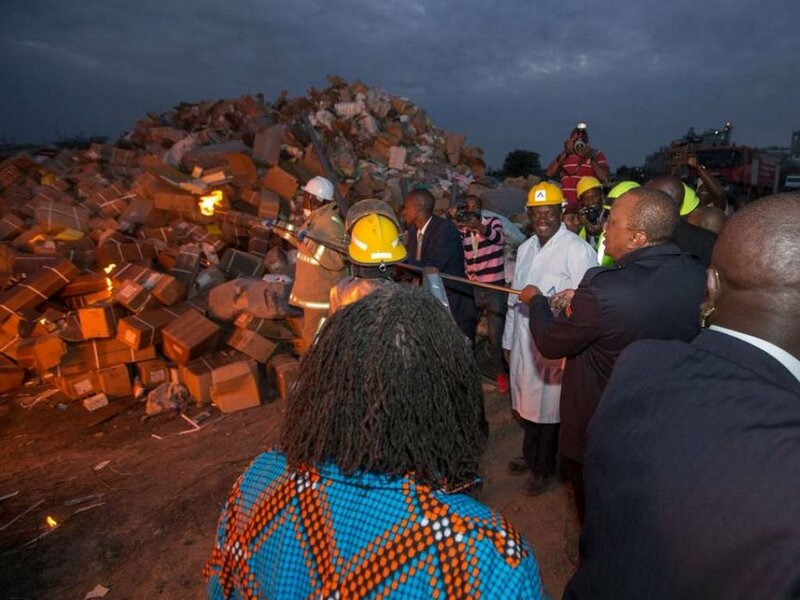 President Uhuru Kenyatta leads the country during the destruction of Sh1.5 billion worth of illicit goods last year. “The private sector and the government need to join hands to come up with practical solutions geared at increasing the country’s manufacturing base so as to create jobs for the youth,” President Kenyatta said during the formulation of the team. Within six months, the Rapid Results Initiative (RRI) had netted counterfeits and contrabands worth Sh8.5 billion (US$84.5 million), some which the President led their destruction last year including high end luxurious vehicles. 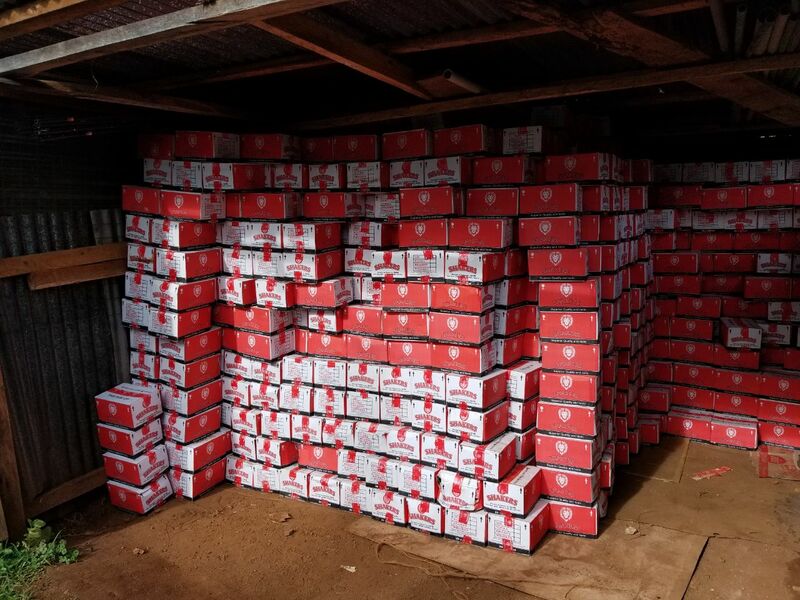 ACA on its own has nabbed goods worth Sh2.1 billion (US$20.9 million) with Sh612 million (US$ 6.09 million) worth of counterfeits being destroyed. The government is counting on a regional anti-counterfeit law to address the problem that is not only affecting manufacturers and government revenues in the East African states, but also jeopardizing the health of their citizens. Proceeds of counterfeits and illicit trade are also said to fund terrorism and organized crime, a problem that comes back to haunt the governments, pushing them to hive bigger portions of their budgets into security as opposed to the much needed development projects. An anti-counterfeit Bill (East Africa) is pending at the East African Legislative Assembly (EALA ) and players in Kenya are hoping the bill can be enacted into law to help eradicate the menace. “We all need to read from the same script to be able to effectively fight and win the counterfeit war,” Ms Mutahi told The Exchange. The Anti Counterfeit body in Kenya is also counting on an additional 58 inspection officers it plans to recruit this year to enhance the fight against counterfeits, especially through heightened surveillance at the country’s borders. Last year, Kenya also received support from the UK government to help digitalise operations at ACA, in a financing agreement worth US$1.5 million through the UK Department for International Development (DFID). The move is expected to ease the information flow from detection, reporting and destruction of illicit goods in the country. The funding is being channeled through TradeMark East Africa (TMEA), with the project expected to better and efficiently serve stakeholders nationally, regionally and globally.